In this tutorial, we present a method to render Golaem simulations with Unreal Engine. The really big advantage of this method is that it avoids baking out geometry from Maya and handles both geometry and shading variation. The figure below details the workflow of the render of Golaem simulations with Unreal Engine. Create your Crowd Simulation within Maya using Golaem . 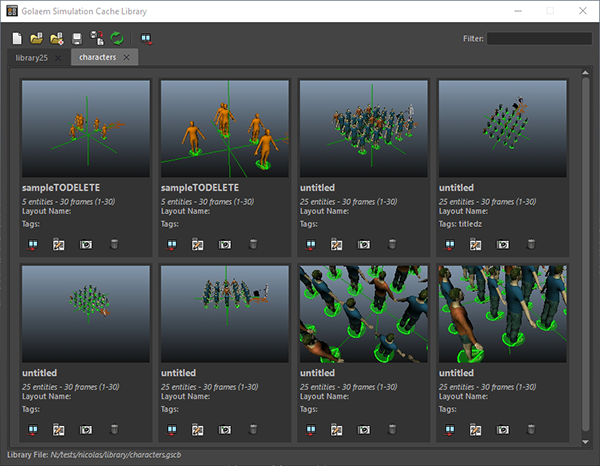 In our example we will use the locomotion scene from the Golaem Crowd Samples. Once the simulation is done, open the Simulation Exporter to export the Simulation Cache. Once the Simulation Cache will be exported, a Simulation Cache Library File (.gscb) will be created in the same directory than the Simulation Cache. It is also possible to add the exported simulation to an existing Simulation Cache Library File using the Library Tool. A few steps must be undertaken for Unreal Engine to be able to load and render with the Golaem plugin. If you run the Golaem for Unreal plugin without a license, it will be in PLE mode. Therefore some meshes will be missing on your characters. This is done on purpose, of course with a license, all meshes will be there. For the Golaem Simulation Cache Library Tool to work properly, some third party dependencies need to be manually installed. If you do not plan to use the Library Tool, you can skup this part. 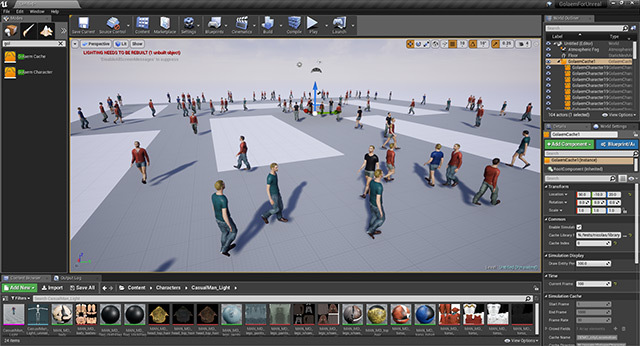 The actual transformation and scale of the node in the Unreal Engine scene is taken into account. If you'd like to change any Crowd Shader properties (texture, color, displacement, multi matte IDs...), it can be done on the assigned Materials in Unreal Engine (see above). If you'd like to change the assets repartition or the shading assignment, it must be done in the Character Maker in Maya. When done, you just need to save the changes in the Character File. Reexporting the library file is not required.